Photo courtesy of Kate Mackin. – How do you know this is not an English T-shirt? – It says ”Lovely weather”. Buy this shirt? Oh well, if I must. The beatniks are making a comeback! Lovely weather she’s wearing that or not. Promotional t-shirt for Stephen King new book – Dusty. If your books are musty, you need to let some fresh erratum. Is this like those jeans that already look worn when you buy them? I bought some of these books and now I have a phew. Ashes to ashes, must to dust. We’re all made in the same mould. Just that, some of us are mouldier than the others. This Dutch bloke has been learning english for about a year. So he goes over to england for a weekend, to see how his engllish is going. When he arrives, it is the first day of Spring, and there is not a cloud in the sky. I hear this book store has a “lovely personality” too. Is it a really many? I will not buy it if it is not a really many. This shirt is a musty. 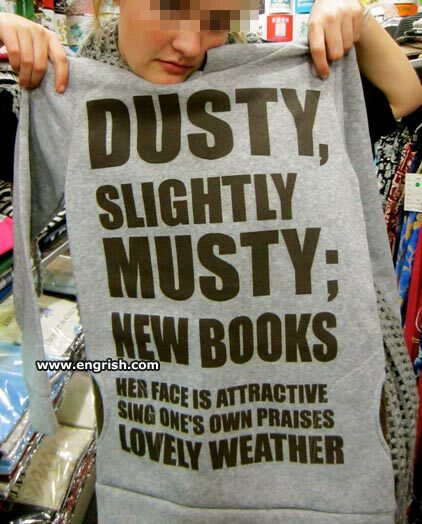 How can NEW books be “dusty” and “slightly musty?” This is a complete rip-off! So, where can I get a new book in medium long, wash and wear? Well, that’s a big semicolon. @01812. Well. A Colon can be up to 5 feet long.